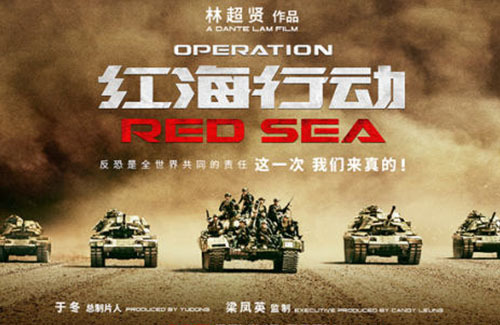 Directed by Dante Lam (林超賢), war film Operation Red Sea <紅海行動> is breaking new heights for the local Chinese film industry. The film is the second release to Dante’s war film series, the first being last year’s Operation Mekong <湄公河行動>. Operation Red Sea stars Zhang Yi (張譯) and Johnny Huang Jingyu (黃景瑜) as members of the Chinese navy which was involved in the 2015 Yemeni Civil War. Operation Red Sea focuses on the rescue and evacuation of several hundred Chinese citizens from the country. The film, which reportedly took 500 million yuan to make, was shot in Morocco and Dubai. The Moroccan army lent the film crew a set of tanks, helicopters, and weaponry for the war scenes, which took about two months to do. The film makes its way into cinemas on Chinese New Year. Check out the trailer below! a heroin with guns. nice, i like that! Yes, go for it. And the next movie should be “Operation ISIS”.